The current 15,500 seater athletics stadium was built on the site of the football ground by M J Gleeson and opened in 1964. From 1999 to 2012 it hosted the London Grand Prix. The stadium can be expanded to 24,000 with temporary seating if required. Sand from the Beach Volleyball Courts at Horse Guards Parade during London 2012 was donated to Crystal Palace National Sports Centre in 2012. The current athletics stadium is on the same land as a previous football ground, which hosted the FA Cup final from 1895 to 1914 as well as other sports. In 1905, the owners wanted their own football club to play at the venue, so they formed Crystal Palace F.C.. 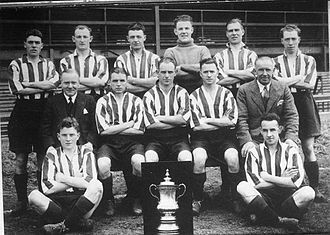 The club were forced to leave by the military, in 1915, and now play at nearby Selhurst Park. 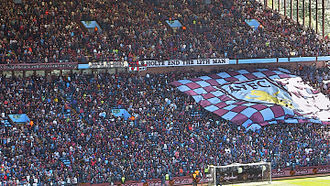 The largest 'domestic' attendance ever at the stadium was in the 1913 Cup final between Aston Villa and Sunderland, when 121,919 spectators squeezed into the stands. 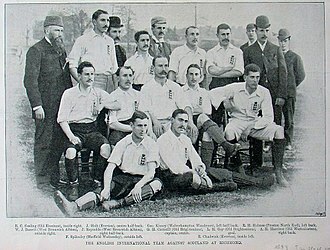 The previous world record had been the 1901 Cup Final, when 114,815 amassed to watch Tottenham Hotspur and Sheffield United draw 2–2, (Spurs won the replay at Burnden Park). Crystal Palace F.C. have played reserve team matches in the past at the centre, most recently in 2001, and in January 2011 the club's owners announced plans to relocate the club back to the site of the NSC, redeveloping it into a 40,000-seater, purpose-built football stadium. Tottenham Hotspur F.C. also released plans to redevelop the NSC into a 25,000-seater stadium, maintaining it as an athletics stadium, as part of their plans to redevelop the Olympic Stadium after the 2012 Summer Olympics and Paralympics. However, their plans were cancelled due to their failure to obtain the Olympic Stadium. AC London used the stadium during the 2015–16 season. 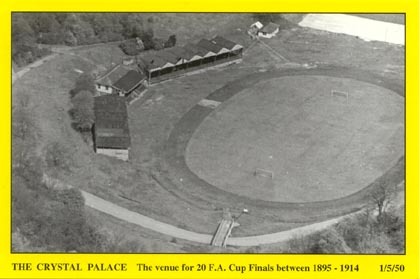 21 teams competed in the twenty FA Cup Finals staged at Crystal Palace, with ten different winners. Four more teams won the FA Cup during this time, after replays at other grounds. 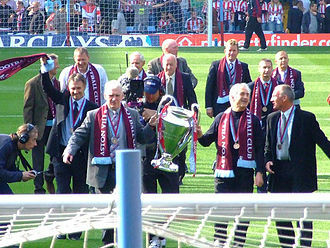 Newcastle United appeared in the most finals at the ground, five, but never lifted the cup there, whilst Aston Villa won all four of their games there. 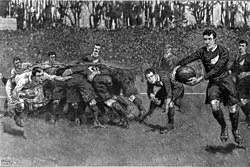 On 2 December 1905, the ground also held the first England rugby union international match against New Zealand in England, New Zealand winning 15–0. 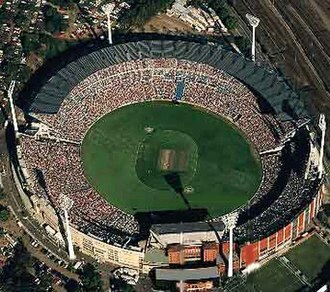 On Wednesday 18 August 1965, the ground was the venue of the Rugby league match in which the Commonwealth XIII rugby league team were defeated 7–15 by New Zealand. It also played host to Fulham Rugby League in the mid-1980s for a couple of seasons, after they were forced to leave their previous ground of Craven Cottage. London County Cricket Club was a short-lived cricket club founded by the Crystal Palace Company. In 1898 they invited W. G. Grace to help them form a first-class cricket club. Grace accepted the offer and became the club's secretary, manager and captain. As a result, he severed his connection with Gloucestershire County Cricket Club during the 1899 season. 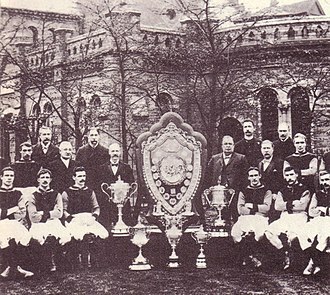 The club played first-class matches from 1900 to 1904. Some of the best players of the time played some matches for the club while continuing to play for their usual teams, among them CB Fry, Johnny Douglas and K S Ranjitsinhji. 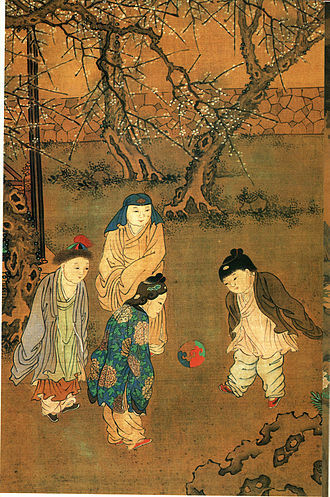 However, the games were little more than exhibition games — and money-making exercises for Dr Grace — and so it quickly lost its first-class status, and with that the ability to attract the top players. The club folded in 1908. London Lions used the basketball arena as their home from 2012 to 2013. The 2,000 capacity indoor Arena at the National Sports Centre was also home to former British Basketball League team's Crystal Palace and London Towers. Crystal Palace eventually merged into the London Towers organisation in 1998, whilst after great success domestically and in European competition the Towers ran into severe financial difficulties and folded its professional team in 2006. During its most successful period, Towers alternated between Crystal Palace and Wembley Arena as its home venues. For the 2012–2013 season, the London Lions played the home games at Crystal Palace National Sports Centre until they moved to the brand new Copper Box in 2013. From 2018, the Arena once more became a BBL venue when it was announced as the home of the new London City Royals franchise, the second London based franchise in the league. The stadium hosted the 1989 National Championship Game for American Football, called the Budweiser Bowl, where the Manchester Spartans won the Great Britain National Championship by defeating the Birmingham Bulls by a score of 21 – 14. This National Championship Game was broadcast nationally on Channel 4. This was the height of the Great Britain – NFL relationship and partnership as the NFL supported the game, and the NFL commissioner and front office attended the game. The Cleveland Browns and the Philadelphia Eagles players and cheerleaders also attended, as they were the two teams who were playing the next day in the American Bowl at Wembley Stadium. The NFL's Tex Schramm presented Spartan player/head coach Terry Smith with the National Championship Trophy at Wembley Stadium the next day. The stadium also hosted the 1990 National Championship Game for American Football, called the Coca-Cola Bowl, where the Manchester Spartans repeated as the Champions of Great Britain, winning their second National Championship in a row by defeating the Northampton Storm by a score of 21-19. The NFL also attended the 1990 Great Britain Championship Game at Crystal Palace, as did the players and cheerleaders for the New Orleans Saints and the Los Angeles Raiders as they were the two teams playing in the American Bowl the next day at Wembley Stadium. 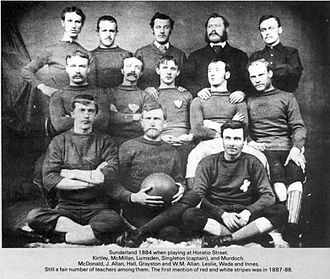 The Manchester Spartans second National Championship came only one week after the Spartans had won the European Club Championship in Italy when the Spartans defeated Dublin, Amsterdam, Berlin, and Milan to become the first British team to ever win the European Club Championship. The player/head coach of the Manchester Spartans was Terry Smith, who also was the Great Britain National Team Head Coach. With Smith at the helm of the Great Britain National Team in 1989, and with 12 Spartans players playing for Great Britain,the Spartans players and coach led Great Britain to the European Nations Championship in 1989 by defeating France, Germany, and Finland by a combined score of 99 – 6 for Great Britain's first European Championship for the Great Britain National Team. The Sports Arena was also used by the London Monarchs, who also played some games at the stadium as England Monarchs before the team became defunct. The Monarchs were unfortunately never able to follow-up on their title-winning success in the inaugural World League of American Football season of 1991, never again making it to another World Bowl, the playoffs, or even a second winning record. Their title defence never materialised, ending 1992 with a 2-7-1 tally; after a two-year league hiatus, four seasons from 1995-1998 in a revived league of six European cities garnered three straight 4-6 records, before bowing out with a 3-7. The main stadium pitch is currently used by the London Olympians and is the home of the Great Britain Lions, the national American football team. 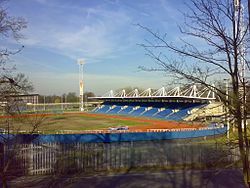 The stadium played host to the 2011 Britbowl, the championship game of the British American Football League, which was won by the London Blitz. 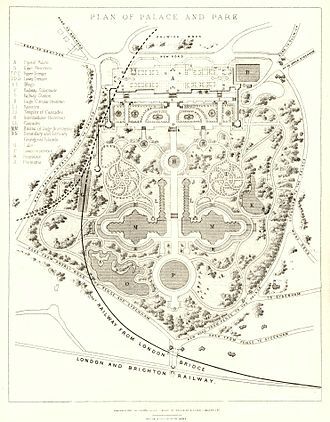 Crystal Palace race circuit was located in Crystal Palace park, the outline of the track can still be seen on maps providing access to the Crystal Palace National Sports Centre that is also located in the park. The circuit opened in 1927 and the first race, for motorcycles, was on 21 May 1927. The circuit was 1 mile long, and ran on pre-existing paths through the park, including a loop past the lake. The surface had tarmac-covered bends, but the straights only had hard-packed gravel. Improvements begun in December 1936 increased the circuit to 2 miles, and tarmac-covered the entire length. 20 cars entered the first London Grand Prix on 17 July 1937, a race eventually won by Prince Bira in his ERA R2B Romulus at an average speed of 56.5 mph (91 km/h). Later that year, during the International Imperial Trophy meeting also won by Bira, the BBC broadcast the first ever televised motor racing. With the outbreak of World War II, the park was taken over by the Ministry of Defence, and it would not be until 1953 that race meetings could take place again. The circuit had been reduced in length to 1.39 miles, bypassing the loop past the lake, and pressure from the local residents reduced motor sport in the park to five days a year. A variety of races took place at the circuit including sports cars, Formula Three, the London Trophy for Formula Two, and even non-championship Formula One races. The last International meeting was in May 1972, the final lap record going to Mike Hailwood at an average speed of 103.39 mph (166 km/h). 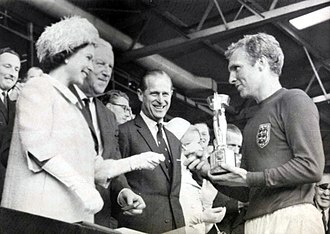 The final meeting was held on 23 September 1972, but club events continued until 1974. Although the circuit no longer exists, it can be driven in the Grand Prix Legends historical motor racing simulation, for which it was recreated in detail. It was later converted to several other racing simulation programs. Adjacent to the Olympic swimming pool exists a small race circuit for radio-controlled cars. The site is the home of the London Radio Car Club (LRCC). 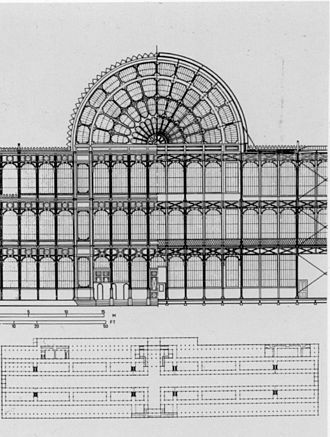 The first British Motor Show (then known as the 'London Motor Show', which was one of the first of its kind in the world), was held at Crystal Palace in 1903. Organised by the Society of Motor Manufacturers and Traders (SMMT) it subsequently moved to Olympia for the next 32 years. 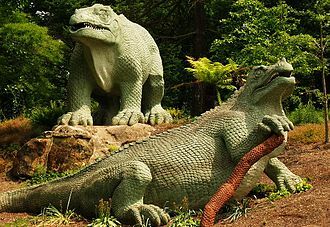 Crystal Palace Sports Arena is a proposed football stadium which could be built in Crystal Palace Park, to replace Selhurst Park as the home stadium of Crystal Palace Football Club. 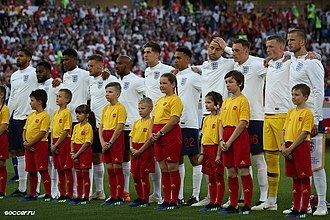 It was announced in January 2011, as a redevelopment of the current Crystal Palace National Sports Centre, and was planned to be ready for the 2015–2016 football season. Crystal Palace F.C. submitted plans to rebuild the stadium as a 40,000 seater football stadium without a running track, but with a new indoor aquatic and sports centre as part of the complex. 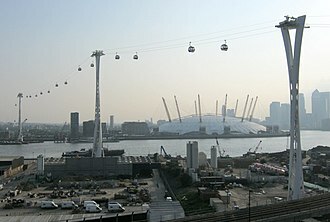 A London Tramlink extension to the area was proposed to coincide with the completion of the stadium. On 4 December 2017, Crystal Palace F.C. unveiled plans to redevelop Selhurst Park and expand its capacity to 34,000, which suggested they had abandoned plans to redevelop the national centre. ^ Historic England. "Details from image database (468978)". Images of England. Retrieved 30 April 2009. ^ "Gleeson spurns takeover advance". Yorkshire Post. 9 January 2006. Retrieved 13 October 2013. ^ a b "Eagles Fly Home". Crystal Palace F.C. 28 June 2011. Archived from the original on 7 September 2011. Retrieved 13 October 2013. ^ "…and win at Crystal Palace". rugbyleague.org. 31 December 2008. Retrieved 1 January 2009. ^ Alan Gibson: The Cricket Captains of England (1989), p57. ^ Christopher Martin-Jenkins: The Wisden Book of County Cricket (1981), p441. Wikimedia Commons has media related to Crystal Palace National Sports Centre. Sheffield Wednesday Football Club is a professional association football club based in Sheffield, England. The team competes in the Championship, the tier of the English football league system. 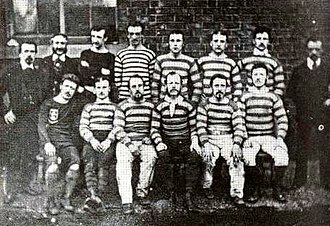 Formed as an offshoot of The Wednesday Cricket Club in 1867, in 1868 they won the Cromwell Cup, only the second tournament of its kind, and in 1877 they won the inaugural Sheffield Challenge Cup, the oldest county cup in England. They were founding members and inaugural champions of the Football Alliance in 1889, in 1992 they became founder members of the Premier League. 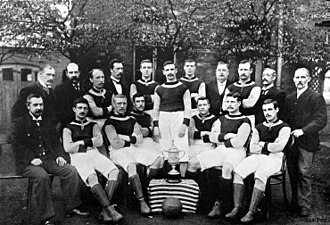 The club has spent most of its history in English footballs top flight. The Owls, as they are nicknamed, have won four league titles, Wednesday have competed in UEFA cup competitions on four occasions, reaching the quarter-finals of the Inter-Cities Fairs Cup in 1963. Since 1899 the club has played its matches at Hillsborough stadium. Although no contemporary evidence has found to support the claim. 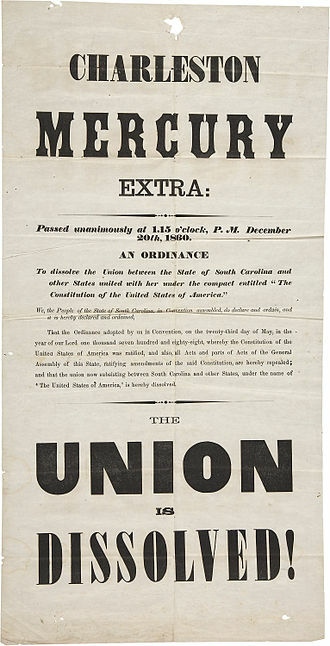 Nevertheless, an 1842 article in Bells Life magazine states the club was founded as far back as 1816, the club was so named because it was on Wednesdays that the founding members had their day off work. They were initially based at the New Ground in Darnall, and often went by the name of Darnall Wednesday, in 1855 they were one of six clubs that helped build Bramall Lane, and held a wicket there for many years. The proposal proved very popular, with over 60 members signing up for the new team on the first night and they played their first match against The Mechanics on 19 October the same year, winning by three goals and four rouges to nil. 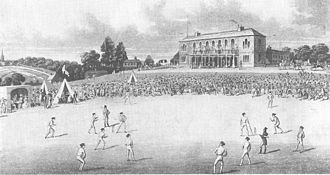 On 1 February 1868, Wednesday played their first competitive match as they entered the Cromwell Cup. A week after their semi-final, they went on to win the cup, beating the Garrick club in the final after extra time, a key figure during the formative years of the football club was Charles Clegg, who joined the Wednesday in 1867. 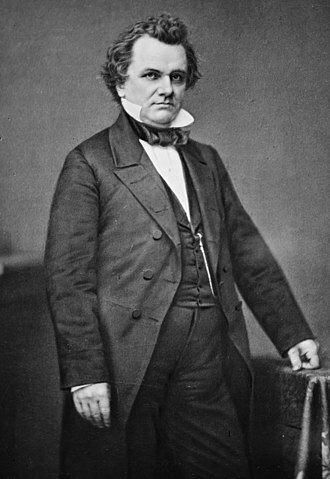 His relationship with the club lasted for the rest of his life and he became president and chairman of the Football Association, and was known as the Napoleon of Football. In 1876 Wednesday acquired Scot James Lang, although he was not employed by the club, he was given a job by a member of the Sheffield Wednesday board that had no formal duties. 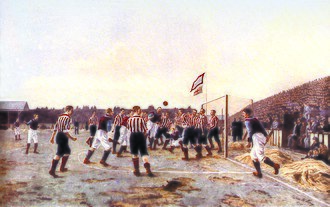 The 1895 FA Cup Final was contested by Aston Villa and West Bromwich Albion at Crystal Palace. 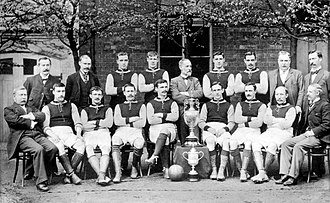 Aston Villa won 1–0, with Bob Chatt being credited with scoring the fastest goal in FA Cup Final history and this record would stand for 114 years before being broken by Louis Saha of Everton in the 2009 FA Cup Final with a goal after 25 seconds. 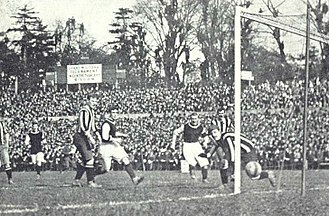 The final was played for the first time at Crystal Palace, the weather for the final was described as a beautiful spring day, and consequently the crowd and press were still coming into the ground when the game kicked off. From the kick-off, John Devey, the Villa centre-forward, swung the ball out to his inside-left, Hodgetts long cross-pass found Charlie Athersmith on the right, and his centre fell to Bob Chatt who sent the ball goalwards on a half volley. There are no accurate timings for the goal and different reports time it at between 30 and 39 seconds, at the time, many of the crowd and press missed the goal as they were still taking their seats, and the press reports indicated that Chatt had scored. Sir John Leslie Martin was an English architect, and a leading advocate of the International Style. Martins most famous building is the Royal Festival Hall and his work was especially influenced by Alvar Aalto. After studying at Manchester University Leslie Martin taught at the University of Hull, in 1937 he co-edited with Ben Nicholson and Naum Gabo the journal Circle that reviewed avant-garde abstract art and architecture. 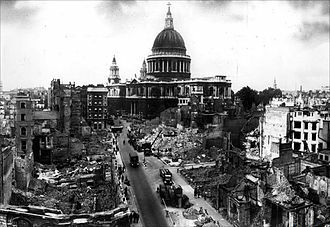 In 1939 Martin, and his wife Sadie Speight, co-wrote The flat book, during the Second World War Martin was assigned to the pre-nationalisation Railway companies to supervise re-building of bomb damaged regional rail stations. In this capacity Martin developed pre-fabricated designs to speed construction, from 1956 Martin was made head of the Architecture School at Cambridge University where Colin St. John Wilson was his assistant. He was Slade Professor of Fine Art at the University of Oxford for 1965–66, Martin was involved initially with Patrick Hodgkinson in the Brunswick Centre, an early experiment in planned mixed-use development in Bloomsbury that was partially completed. The 1950s saw the creation of the Loughborough Estate in Brixton, South London, in the 1960s the British government commissioned Martin to draw plans for a wholesale demolition and redevelopment of the area between St. Jamess Park and the Thames Embankment in London. The plans met with determined opposition from the public and conservation groups, especially the Victorian Society, the Heath Government eventually formally abandoned Martins plan in 1971. The existing buildings were restored and opened to the public. Taking a broader view of Martins work, a picture emerges of the man as a quiet achiever par excellence, through his skilled networking in support of promising younger architects, and his self-effacing work on committees, he strongly influenced the course of post-war British architecture. He was efficient, impeccably well networked and calmly authoritative, justifying his advice with his architectural expertise. 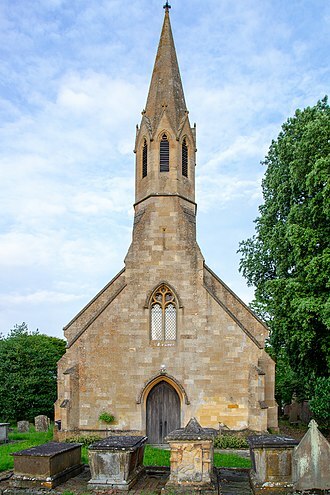 Cross faculty libraries, St Cross Road, for Oxford University, Martin was the masterplanner for Leicester University. 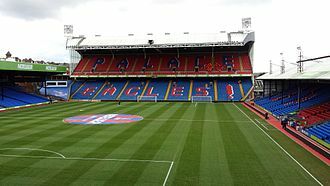 Selhurst Park is an association football stadium located in the London suburb of South Norwood in the Borough of Croydon. It is the current home ground of Crystal Palace Football Club playing in the Premier League, the stadium was designed by architect Archibald Leitch and opened in 1924. The stadium has hosted one football match as well as games for the 1948 Summer Olympics. Part of the stadium incorporates a branch of Sainsburys, the stadium was shared by Charlton Athletic F. C. from 1985 until 1991 and by Wimbledon F. C. from 1991 until 2003. In 1922 the site, a former brickfield, was bought from the London, the club had been pursuing a deal for the ground as early as 25 February 1919. There was only one stand, the present Main Stand, two years later, on St Davids Day in 1926, England played Wales in an international at the stadium. England amateur matches and various other finals were staged there, as were other sports including boxing, bicycle polo and cricket. In addition to this, it hosted two games for the 1948 Summer Olympics, real Madrid marked the occasion by playing under the new set of bulbs – a real footballing coup at the time for third division Palace, as it was Reals first ever match in London. The ground remained undeveloped until 1969, when Palace were promoted to Division One for the first time, the Arthur Wait Stand was built, and is named after the clubs long-serving chairman, who was a builder by trade and was often seen working on the site himself. Arthur Wait was notable for overseeing Palaces rise from the 4th to the 1st Division in the 1960s, the Whitehorse Lane end was given a new look when a second tier of terracing, brick-built refreshments and toilets were provided along the top. 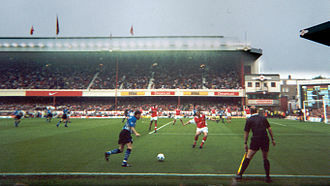 The Safety of Grounds Act required the Holmesdale Road terrace to be split into three sections for safety reasons, the remaining poorer facilities were mainly where opposition supporters were situated. New facilities were built at the back of the Holmesdale Stand. In the summer of 1981, the Main Stand terraced enclosure was redesigned and refitted with seating and this year saw Palace sell the back of the Whitehorse Lane terrace and adjacent land to supermarket retailer Sainsburys for £2m, to help their financial problems. 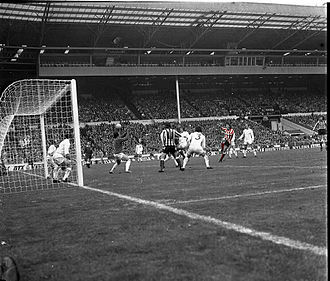 The FA Cup Final, commonly referred to in England as just the Cup Final, is the last match in the Football Association Challenge Cup. With an official attendance of 89,826 at the 2007 FA Cup Final, it is the fourth best attended club championship event in the world. The latest FA Cup Final was the final of the 2015–16 competition, early FA Cup Finals were held mainly in London at venues including Kennington Oval between 1874 and 1892 and Crystal Palace between 1895 and 1914. In the period from 1923 until 2000, the final was held at Wembley Stadium, from 2001–2005, the final was moved to the Millennium Stadium in Cardiff, due to the rebuilding of Wembley Stadium. The Millennium Stadium was used again in 2006 due to delays in opening the new Wembley Stadium. Until 1993, if the final could not be decided in a match, the match would be replayed. 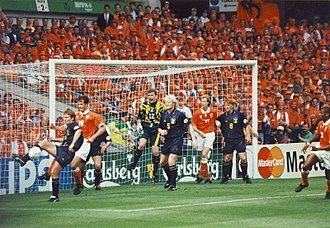 In 1993, the Football Association decided that all future finals would be decided on the day, only two FA Cup Finals have been decided by a penalty shootout, those of 2005 and 2006. London Fields Lido in Hackney, run by GLL.